Hearing loss is an invisible condition that affects 48 million Americans, and 60% of people in the workforce. Though hearing loss affects people of all ages, it is a common affliction for older Americans. In fact, one in three Americans age 65 and older experience some degree of hearing loss. On average, it takes seven years from the time an individual first notices symptoms of hearing loss to the time they decide to seek treatment. However, audiologists and researchers agree that seeking treatment earlier is more beneficial to one’s quality of life. The sense of hearing is crucial in how we process the world, and untreated hearing loss could lead to negative health and socio-emotional consequences. Some recent studies have found potential links between untreated hearing loss and dementia, due to stress caused on certain parts of the brain when struggling to hear. Untreated hearing loss also causes strains in interpersonal relationships where communication is essential. This could lead to social isolation, depression, and anxiety. In some cases, hearing loss is accompanied by tinnitus, a ringing of the ears, which also had adverse effects on one’s physical and emotional well-being. At present, there are many treatments for hearing loss that include innovative new technologies, such as wireless hearing aids and tinnitus sound therapy. When the world begins to sound muffled, and conversations are difficult to piece together, scheduling an appointment to meet with an audiologist is the first step to taking care of your hearing health. There are three types of hearing loss: conductive, sensorineural, and mixed (which is a combination of the former two). Conductive hearing loss involves the malfunction of the outer and middle ear when conducting sound waves. Often times, conductive hearing loss occurs with impacted earwax, head trauma, ear infections (otitis media – infection of the middle ear), or malformations of auditory structures (Eustachian tube, middle ear bones). Sensorineural hearing loss, on the other hand, affects the inner ear. The inner ear is lined with hair cells that act as receptors to sound waves and transform them into electric signals which are processed by the brain as sound. In this type of hearing loss, the disruption of this process may be caused by head trauma, inner ear diseases, aging, and exposure to loud noise. Mixed hearing loss is the combination of conductive and sensorineural hearing loss, due to problems in various parts of the auditory system. As with most medical conditions, hearing loss is linked to other medical issues or conditions. Comorbidity is a medical term which addresses the simultaneous presence of two chronic diseases, or the presence of one or more additional disorders occurring simultaneously with a primary disorder. Learn more about the comorbidities of hearing loss. Long exposure to loud noises has damaging effects on ear cells. Musicians, construction workers, war veterans, and others whose professions consistently subject them to high levels of noise may be at risk of developing hearing loss later in life. At the same time, long exposure in daily life to loud noises (hair dryers, in-ear headphones, home construction power tools, lawn mowers, motorcycles) may contribute to hearing loss. With age, some ear cells naturally die, contributing to hearing loss. 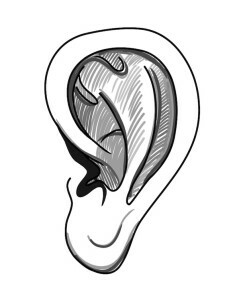 Inside the ear, there are tiny hair cells that amplify and transmit sound waves to be processed by the brain. These hair cells do not regenerate, and thus their death leads to a loss of hearing. Though there is no single cause for age-related hearing loss, many environmental and inherited factors should be considered. Ototoxicity – or “ear poisoning” – is caused by certain drugs or chemicals that adversely affect auditory structures. One antibiotic, aminoglycoside, has been known to cause hearing loss while treating meningitis and other deathly bacterial infections. Researchers have been developing alternatives to these drugs, maintaining their effectiveness with infections while leaving hair cells unscathed. Ear infections may lead to hearing loss, especially in cases of otitis media or “glue ear”, in which the Eustachian tubes of the middle ear are blocked by mucus or fluids. Children are most susceptible to ear infections, due to the small size of their Eustachian tubes, which are still developing. In cases of blockage, tubes are drained to prevent buildup and further infection. Begin Your Journey to Better Hearing Today! Contact us today to schedule a hearing test and consultation with audiologist Laurie Duffy.